I recently made Italian Herb Polenta with Mushroom-Pepper Ragout. I had lots of the Mushroom Ragout leftover. I also had some Alfredo Sauce leftover from a previous meal. Then I got thinking of a way to use these ingredients up so there would be no waste. I really do not like food waste. Then I thought the Spinach-Artichoke Zucchini was so good why not go in that direction. So here is what I came up with for our dinner for tonight. Because everything has already been cooked previously for other meals this lasagna is just a matter of assembling and baking. I love when I can create something from something else. Lets start layering, but first Preheat your oven to 350 degrees. For the base spread some Marinara on the bottom of the pan. Layer pasta on top of the marinara. I dipped it into the sauce and then flipped it over so that both sides of the sauce were covered in marinara. Spread Mushroom-Peppers Ragout onto the pasta sheets evenly. Sprinkle nutritional yeast flakes on top of the ragout. 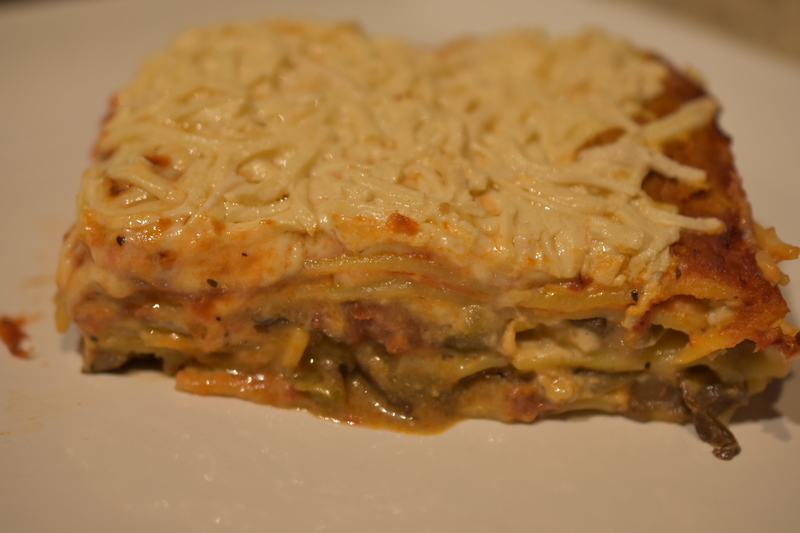 Layer pasta sheets on top of the ragout and nutritional yeast layer. Add another layer of mushroom ragout. Add the last layer of pasta sheets. Spoon Alfredo Sauce over noodles so they are completely coated. Pour marinara on top of Alfredo and swirl the two sauces. Sprinkle nutritional yeast flakes on the top of the sauces. Sprinkle vegan cheese shreds on top of the lasagna. Thanks for stopping by. It was a big hit in my house. It really was so delicious. Thank you. It was really delicious. I appreciate stopping by. I cannot find the recipe for the mushroom and pepper ragout could you please direct me to it? Thanks. You’re welcome.Let me know how it goes.